Except for two days, Congress is on recess for the entire month of August! For many of us, that means our Senators and Representatives are back in their home district. Whether you were able to be a part of the 11th Annual CASE Legislative Leadership Summit or not, you can make sure you communicate with your legislators throughout the year. Getting in touch with them during their time back in their home state is as critical as traveling to DC to visit with them. If you are one of the many school districts that have already started school, then invite your legislators to come visit some of your programs to see the students and the teachers in action. Help them to see exactly what their federal dollars have paid for and are no longer paying for! Give them a face to associate with the cuts they may have to face in the months ahead. Just as we are always "asking" our legislators for something, this is also a good time to "give back" to them. A great photo opportunity for the district and the legislator is a gift you can give them — there is nothing that can make the paper or the TV news like children and legislators. Be sure to get their parents on board, too — not just for permission for the students to be photographed, but also on what the issues are and what our "ask" is for Congress! Aren't sure what the "ask" should be? Click here for a copy of the Talking Points CASE members carried up on the Hill on July 16! Take the CASE "ask" and back it up with local data! Put a face to the needs. If you need help in finding out how to contact your representatives and senators, click here to go to the CEC Legislative Action Center. When you get to the website, just enter your zip code and your legislators will be displayed — click on "info" under the legislator's picture and then click on "contact," you may have to click on "other district offices" if they have more than one local office, especially with Senators. Even if you do not get to actually have a visit from your legislator, become familiar, yes even friends, with the district staff — these folks will be great allies for you in the future! Not only is August a great time for you to become very familiar with the local offices of your legislators, but also to get familiar with the CEC LAC — this is where you go to send letters on hot topics and this is where you will be directed when a Call for Action comes out through CEC and CASE. 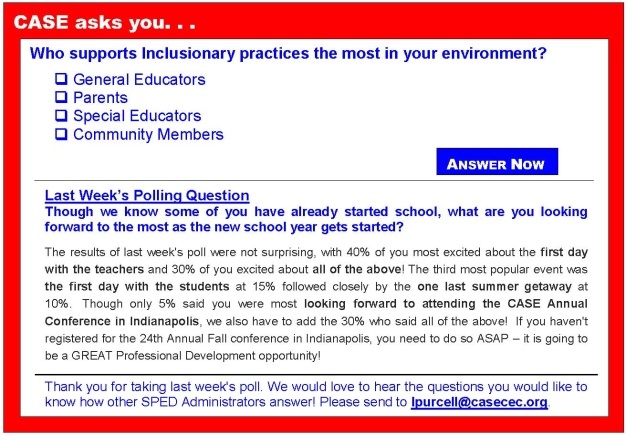 The more you do in August, the easier it will be when (not if) you need to contact your legislators this fall and beyond as special education issues come up! Yes, August is a very important month — hope you have a great one! Join special education attorney Julie Weatherly and Key2Ed on Nov. 12-13 in Nashville, Tenn., for a unique two-day Conference on IEP Facilitation and its legal benefits in a small, interactive learning environment. The U.S. Department of Education has recognized IEP meeting facilitation as best practice through CADRE, and the American Association of School Administrators has recently proposed that the mandatory use of FIEP be included in the next Reauthorization of the IDEA. CEC has initiated a search for an Executive Director to replace Dr. Bruce Ramirez who retired on June 30. His long tenure of service to CEC has been greatly admired and appreciated, and we wish him all the best as he moves into the exciting next chapter of his life. CEC's growth as the voice and vision of special education is of major importance to all of us. To ensure our ability to lead the future of our profession, we engaged a recruitment consultant to help us identify the skills, credentials, experience and characteristics needed in our new Executive Director. Click Here for the Announcement (Exhibit A) and the Job Description (Exhibit B). They're at home, having recently returned for a five week recess from Washington, D.C. And for CEC advocates, it's time to go to work. Your mission is simple: Schedule meetings with your elected officials at their district office anytime from now until Congress reconvenes Sept. 9. With Congress expected to take action on education funding and ESEA reauthorization, now is the time to meet with your Congressional delegation. On Aug. 12 the Obama administration approved Maine for a waiver from some of the most contentious requirements of the Elementary and Secondary Education Act (ESEA), also known as No Child Left Behind (NCLB), bringing the total number state waiver approvals to 40. Since fall 2011, 45 states, as well as D.C., Puerto Rico and the Bureau of Indian Education have requested waivers from ESEA. Researchers aren't sure why, but over the past several years, the number of children reported to have allergies has doubled, to 5 percent of children in the United States. Yet at the same time, in schools and elsewhere, allergies have drawn what some see as an oversized amount of attention. A new paper out of Princeton University explores why that may have happened. A combination of brain scans and reading tests has revealed that several regions in the brain are responsible for allowing humans to read. The findings open up the possibility that individuals who have difficulty reading may only need additional training for specific parts of the brain — targeted therapies that could more directly address their individual weaknesses. The most important back-to-school supply doesn't fit in a backpack, and it can't be ordered online. It's as essential as a pencil, but unlike a pencil, no technology can replace it. In a sense, like a fresh box of crayons, it can come in many colors. Better than the latest gadget, it's possible to equip every student with it, and even better, when we do, it can transform our world. Researchers aren't sure why, but over the past several years, the number of children reported to have allergies has doubled, to 5 percent of children in the United States. Join special education attorney Julie Weatherly and Key2Ed on Nov. 12-13 in Nashville, Tenn., for a unique two-day Conference on IEP Facilitation and its legal benefits in a small, interactive learning environment. In his recent keynote address at the National Charter Schools Conference, Secretary of Education Arne Duncan challenged charter schools to improve outcomes for students with disabilities. After years of lobbying and organizing among families and advocates, Gov. Chris Christie has signed two bills intended to make it easier to identify dyslexic students and improve the training their teachers get. But getting the bills signed could prove the easy part; a host of challenges remain to be met in order to make those improvements stick. But what may be the most consequential bill — one that would require screening of all first-graders for dyslexia and other reading disorders — remains pending in the Legislature, its passage no means assured. While 30 states have already begun implementing curricula aligned to the Common Core State Standards, many of them are struggling to provide the staffing and resources required to implement CCSS effectively, according to a new report from the Center on Education Policy at The George Washington University. The report, "Year 3 of Implementing the Common Core State Standards: An Overview of States' Progress and Challenges," is based on a survey of state deputy superintendents or their designees in 40 of the 46 states that have adopted CCSS in math, English language arts, or both. The survey was conducted from February to May of this year. Looking for similar articles? Search here, keyword COMMON CORE. Science students at all grade levels often struggle with the vocabulary. It's as if we're all SLLs — Science Language Learners. Textbooks and websites are full of specialized words that challenge our students. Some are technical and relate specifically to science (e.g., photosynthesis, thermodynamics, plate tectonics) while others have meanings in science that differ from common usage (e.g., theory, hypothesis, matter). Sometimes we think that students understand a word, only to find out on an assessment that they are confused. States that have adopted a stricter, standardized school curriculum are having difficulty finding the resources to support the more rigorous requirements, a study shows. Of the 40 states that adopted the Common Core State Standards, 34 reported trouble finding adequate funding to support the stringent activities the curriculum entails, said the survey by the Center for Education Policy at George Washington University. Thirty-nine states have garnered a "meets requirements" rating from the U.S. Department of Education's office of special education programs on the quality of their programs for students with disabilities. But this is the last year the annual state reports will focus primarily on "compliance indicators" — for example, timely resolution of due process complaints. The federal special education office is moving to a system that will require states to demonstrate how they are working to improve the educational outcomes for students with disabilities. Not since passage of the No Child Left Behind Act in 2001 has Congress been so outwardly engaged in K-12 policy, yet most advocates remain pessimistic that there will be a new version of the flagship federal education law anytime soon. A big part of the reason: The Obama administration has little incentive to see a bill to revise the Elementary and Secondary Education Act advance in the current legislative climate, in which lawmakers seem more likely to erode, rather than support, the president's policy priorities. Congress has been working on two highly partisan ESEA bills — one of which, the GOP-backed House measure, President Barack Obama has threatened to veto. Back to school usually means new notebooks, new clothes and new teachers. But this year it also means more security, after the shooting deaths of 20 children and six adults at Sandy Hook Elementary School in Newtown, Conn. "We would be remiss if we didn't take a lesson from the Sandy Hook shooting, as horrible as it was," said North Carolina Republican Rep. Craig Horn. He co-sponsored the state's new plan to allow retired police officers or military veterans to serve as volunteer school security officers if they meet requirements set by local sheriffs and police chiefs. A new study out of the University of Cincinnati not only finds that parents feel responsible for taking action when their children struggle with social issues, but also that parents are influenced by their own childhood memories when it comes to dealing with their kids problems. Jennifer Davis Bowman, a recent graduate of the special education doctoral program at the University of Cincinnati, will present her research at the 108th Annual Meeting of the American Sociological Association. Bowman's study focuses on the experiences of parents concerned with their children's social behavior and parents' use of bibliotherapy as a tool for helping their children address this issue.